I love time travel movies. I do. There is so much potential in the world of time travel completely undiscovered, and I always have to see what they do with the film. Sure, you’re almost guaranteed to hit some holes in the writing that really doesn’t make sense when you think about it – even in the best of the best time travel movies. 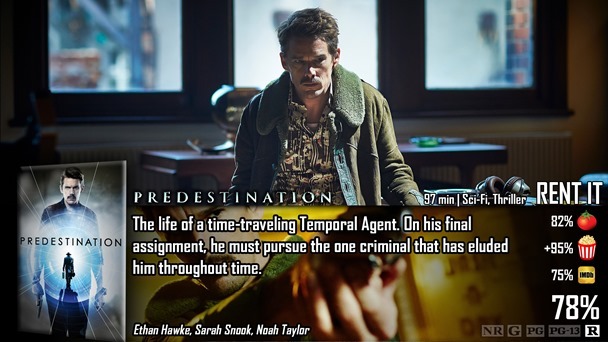 Weirdly enough though, I didn’t have any problem with the time travel used in Predestination. I’m sure there are problems here and there, but I was so engrossed in what I was watching that I didn’t catch any. I’m going to try my hardest to explain the plot without giving too much away, because that’s exactly the type of movie this is – easily spoiled. On the most basic level, it’s about a time-travelling agent that goes into the past to stop crimes before they happen. There is a terrorist on the loose, named the Fizzle Bomber, and to help him stop this man, he must first speak to a mysterious…character…in a bar, whom has an incredible story to tell. You know those movies that just make your head explode? Well, Predestination is one of these movies. I don’t know if it’s trying to be on the same level as Inception or something, but it’s so complicated, and so well thought-out that you can’t help but sit in awe as your brain melts before your eyes. However, this wasn’t an epic movie by any standards – so it had that weird, complicated feeling without that satisfying conclusion feeling. Take that as you will, but for the most part, I consider this a slight flaw. 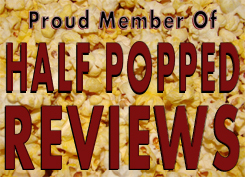 Half of this film, particularly the first half, is just centered on two people talking in a bar. The story “The Unmarried Mother” tells Ethan Hawke’s character is really captivating and you want to see what they do with it, which is why you keep watching. However, when you really think about it, this is a very slow first act – and you really want things to start physically happening. It does, it just takes a minute to get there. Even then, the reveals it attempts to give you are met with more of a shrug and an “I guessed as much” attitude instead of a jaw-dropping experience that it would prefer the audience to have. To me, it was a predictable film…obscure and complicated to no avail, but predictable nonetheless. That’s not to say it won’t be unpredictable to other viewers – I’m just saying how it affected me. Like I said earlier though, this is still a very well thought-out film with so many bizarre moments that you can’t help but just have fun watching the thing as is. Predictable or not, it is absolutely mesmerizing in terms of the direction and pacing. For some reason, you like these characters and their strange chemistry. Sarah Snook as The Unmarried Mother was particularly interesting. I didn’t know what to think of her character when I started watching, but it really started to grow on me, and I truly believe she did a great job with what she was given. Whether or not you think this is a good movie, you’ll probably be drawn in by the direction and concept of the thing – which is bizarre and obscure, but fascinating in its own right. I could say more here, but I don’t want to spoil the reader. I did sense a good level of predictability throughout the movie, although I can’t say why without, again, spoiling the reader. There’s a lot to be said in that area, though. Just watch it. The movie seems decent enough. It at least looks like a good friday night popcorn flick. Good review.